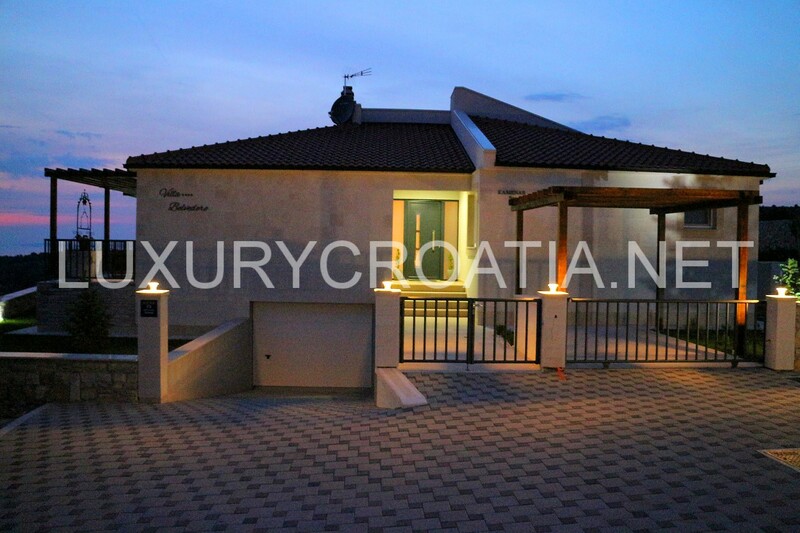 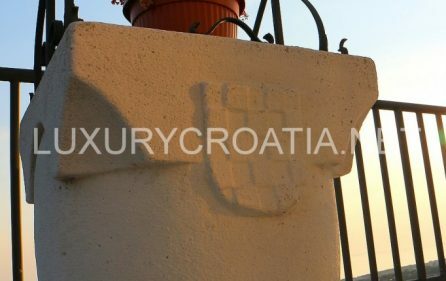 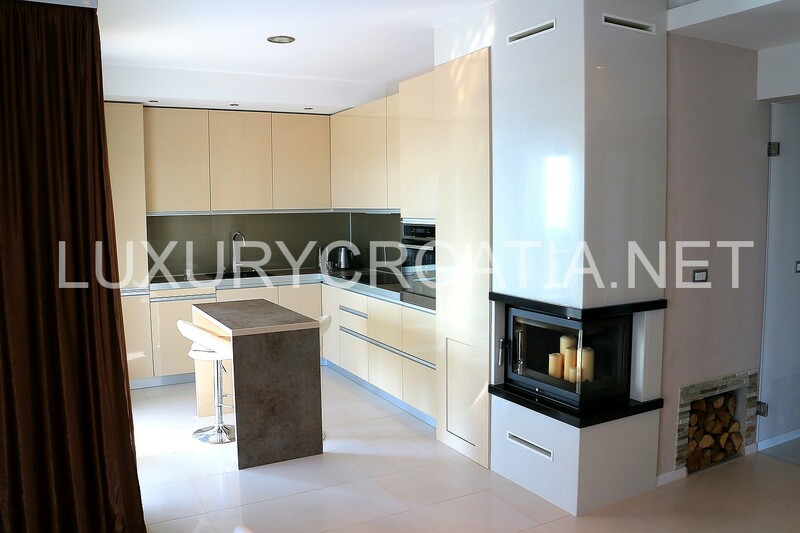 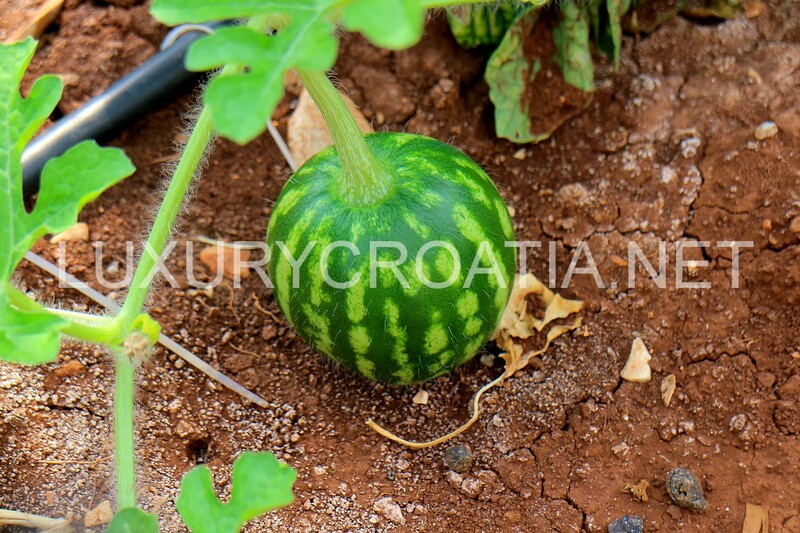 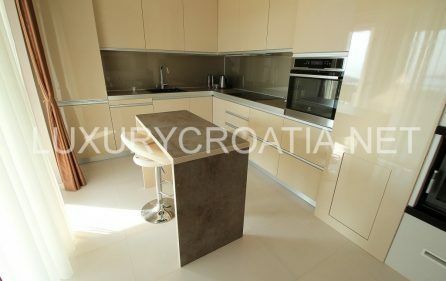 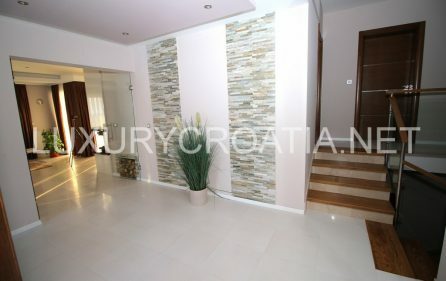 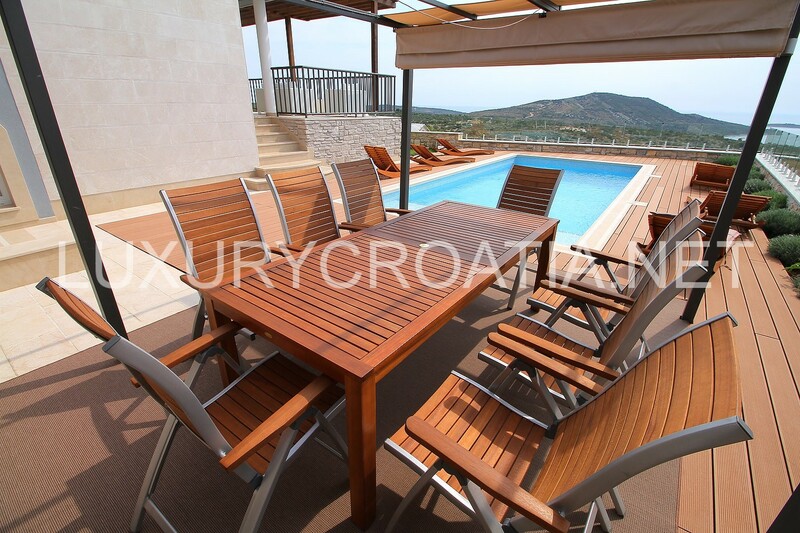 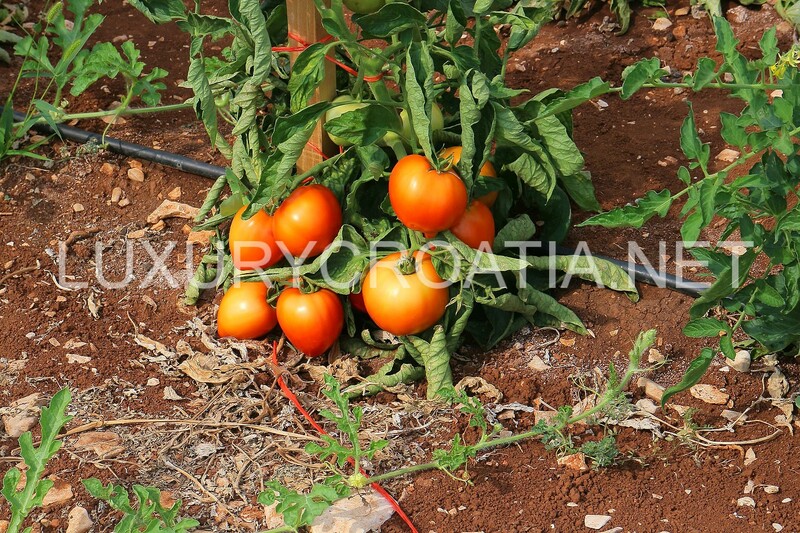 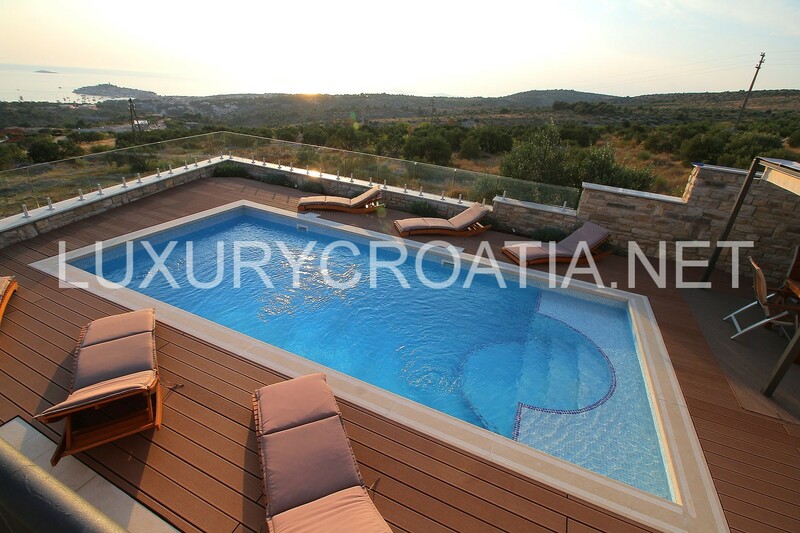 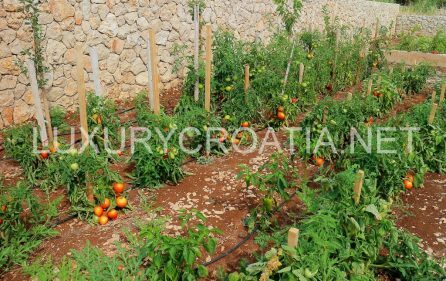 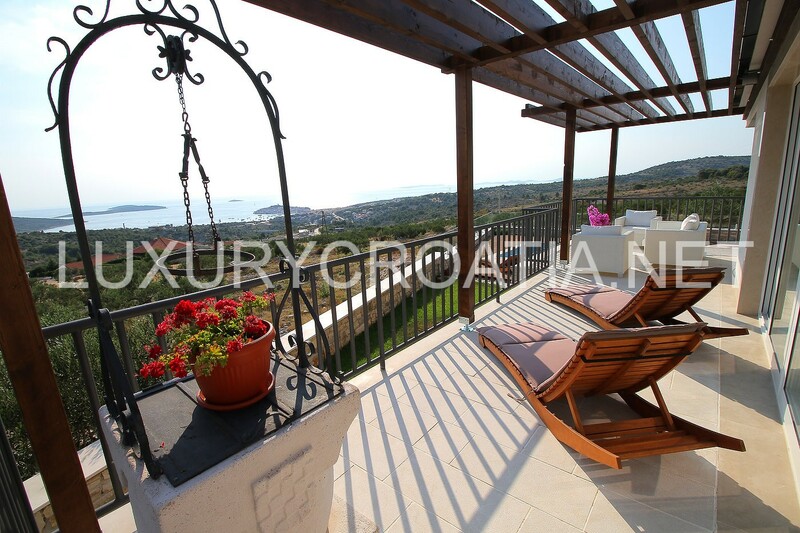 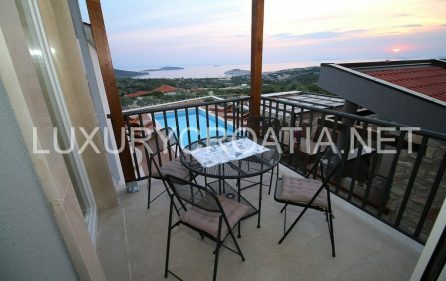 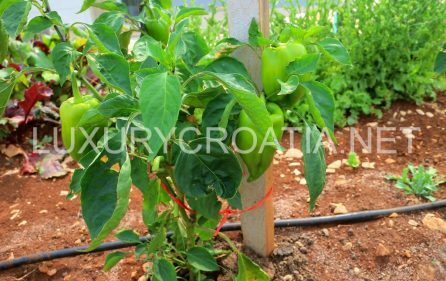 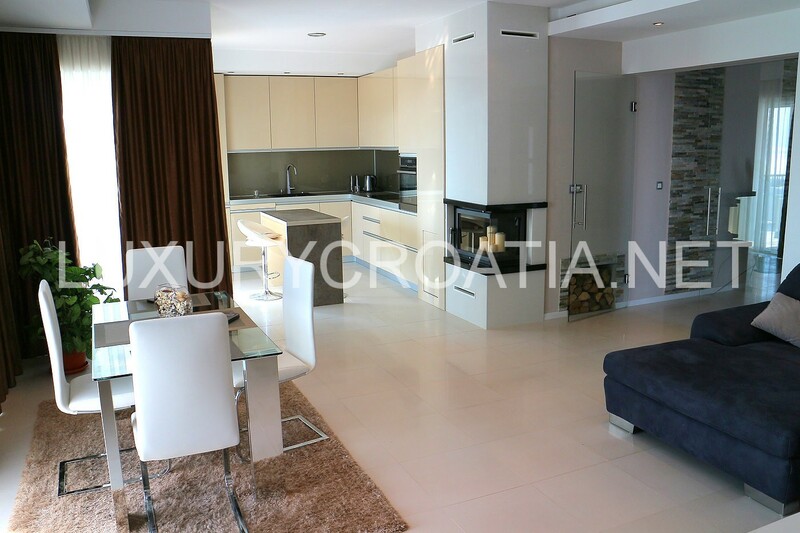 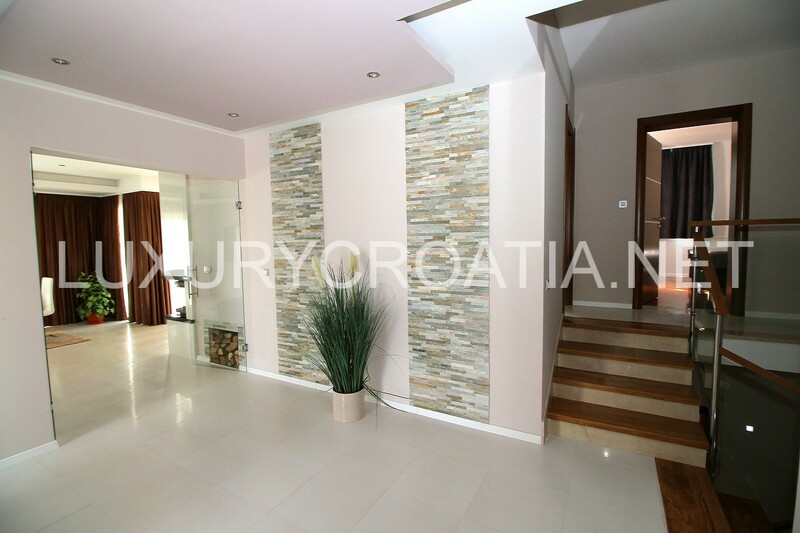 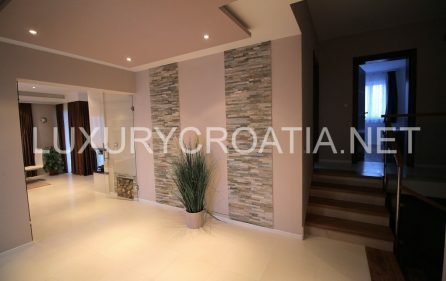 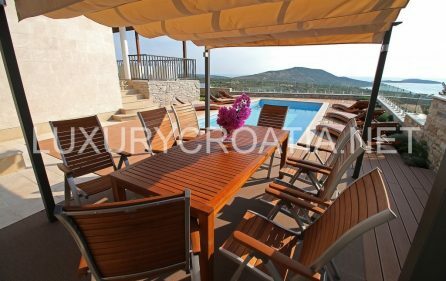 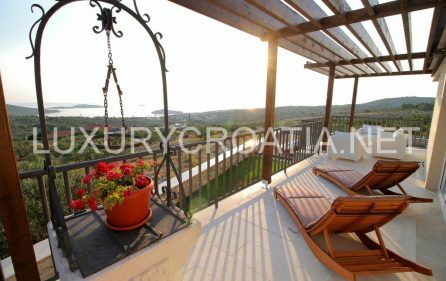 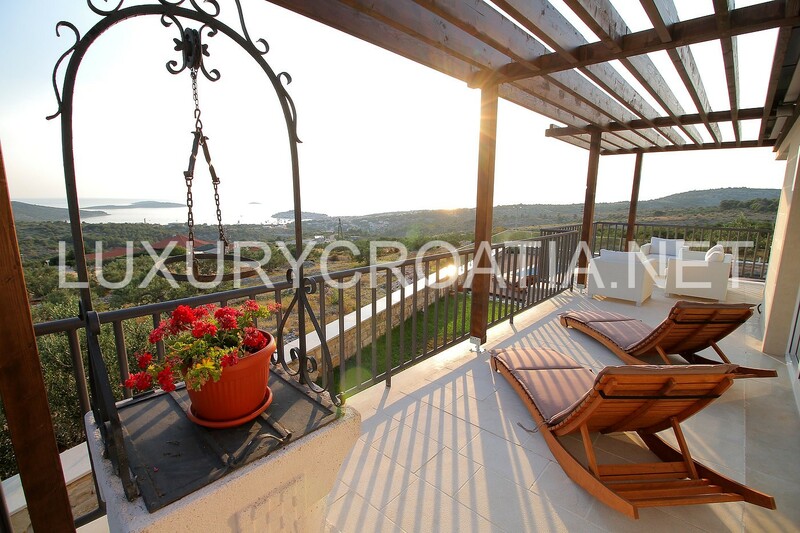 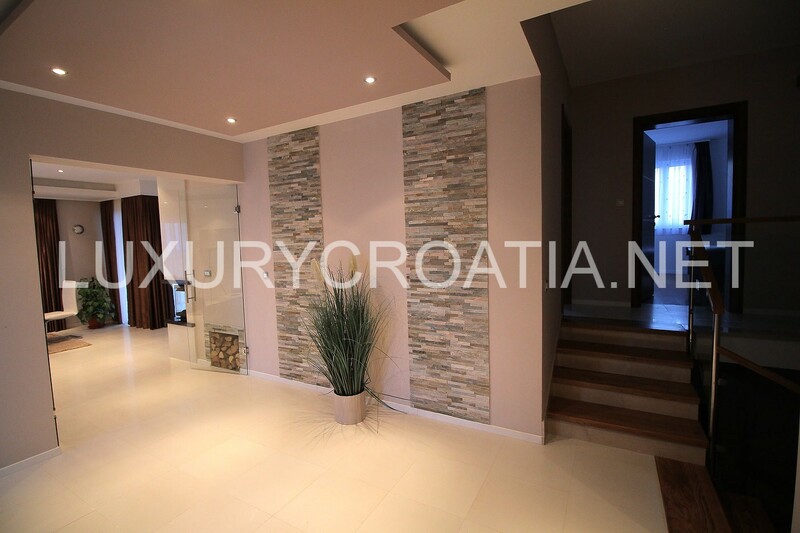 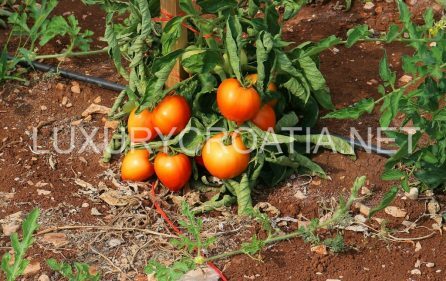 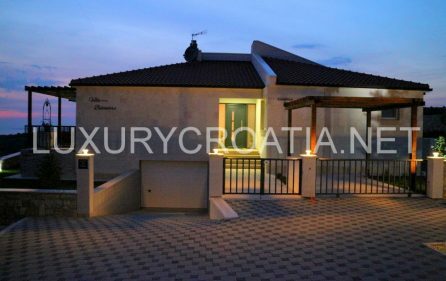 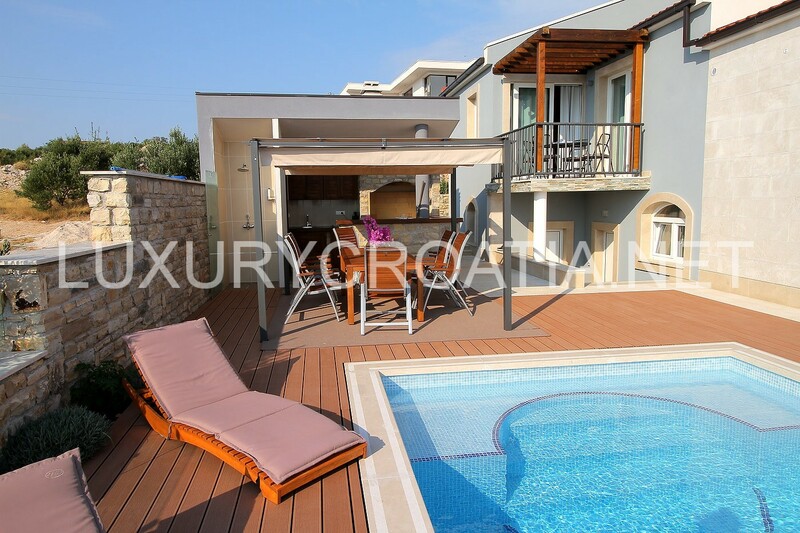 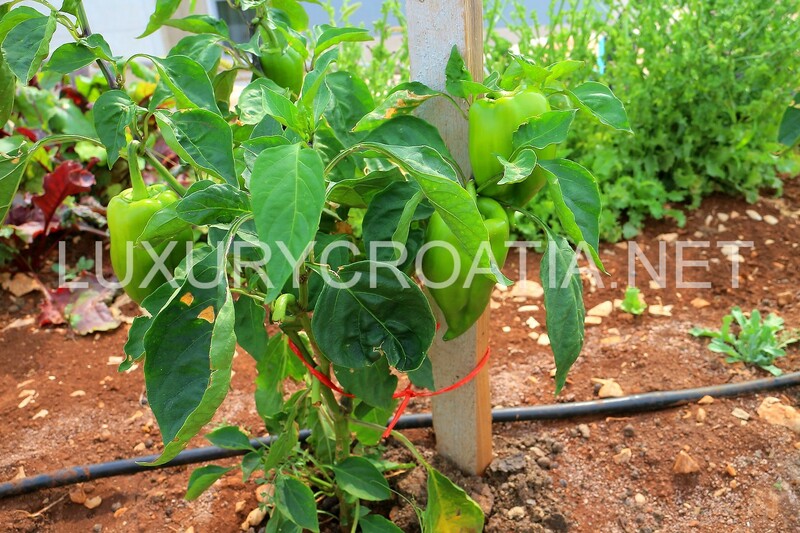 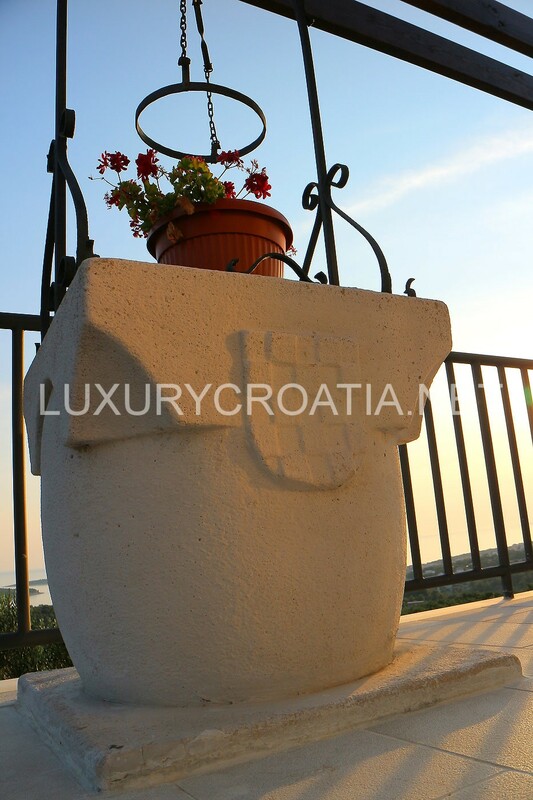 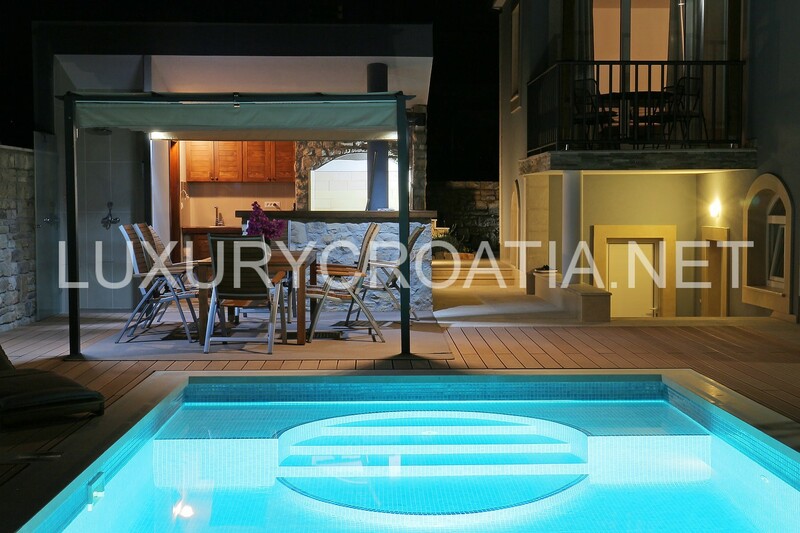 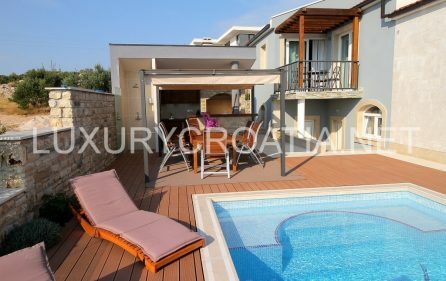 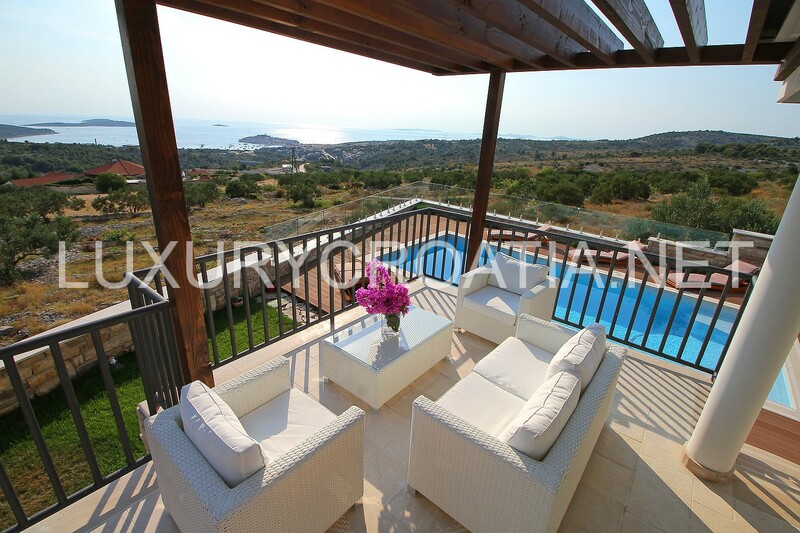 Luxury modern pool villa in Primosten is located near the small but world-renowned destination famous by the nautical tourism and one of the Dalmatian pearls – the town of Primosten. 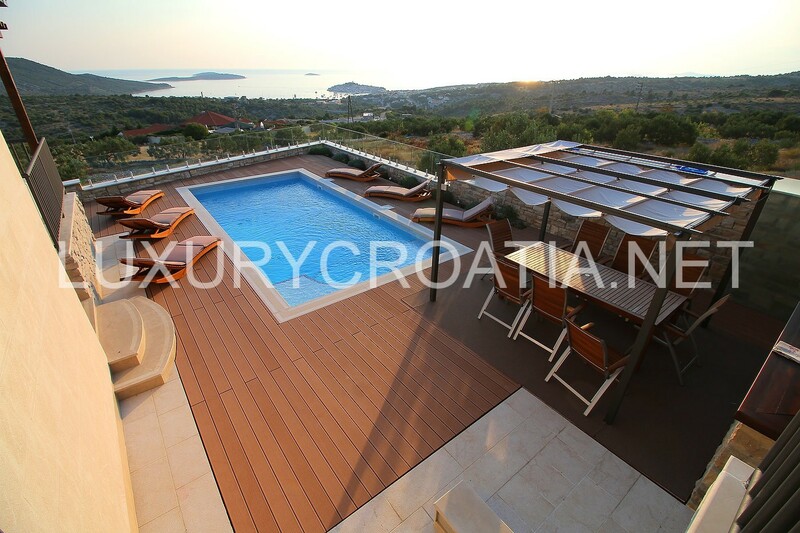 Brand new, recently built, this villa is perfect for a relaxing and memorable vacation. Only 1500 meters away, you can find a crystal-clear sea and the town center. 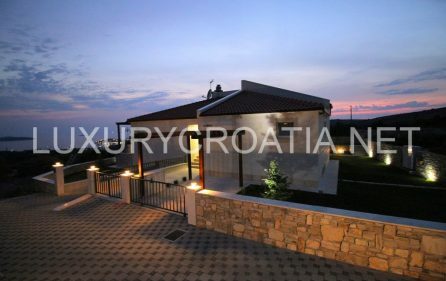 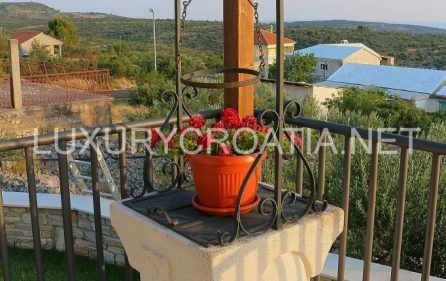 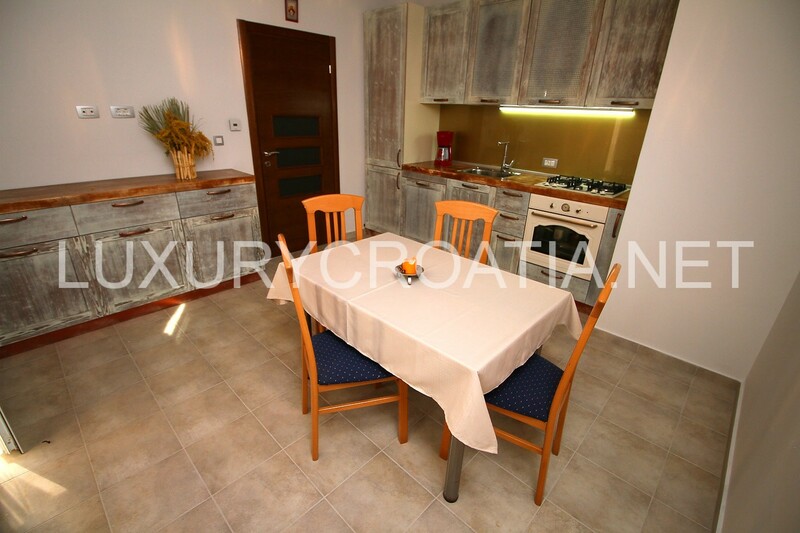 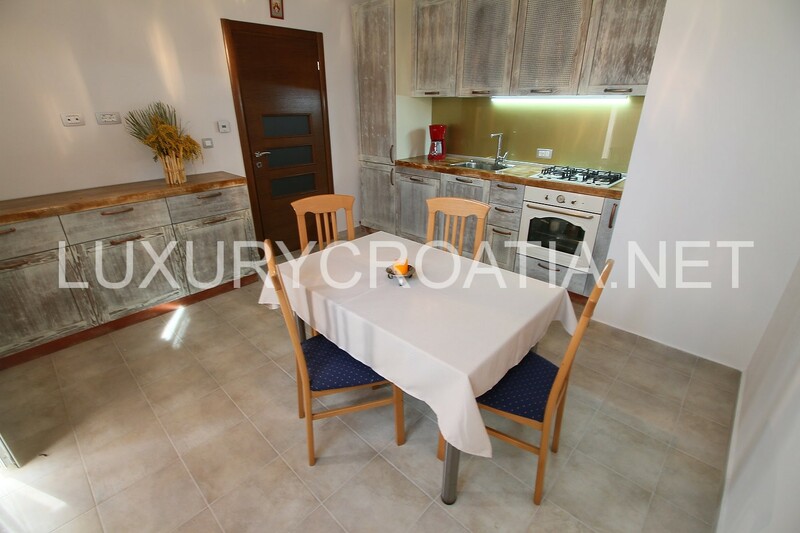 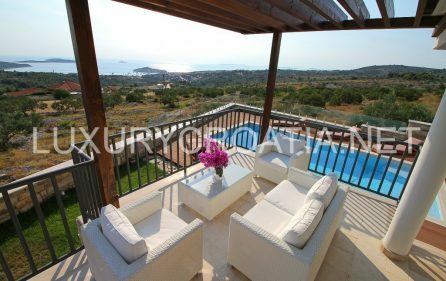 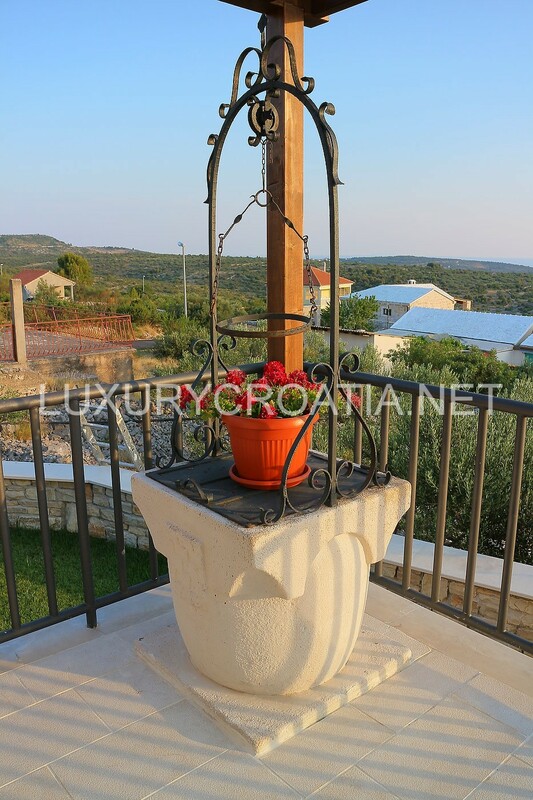 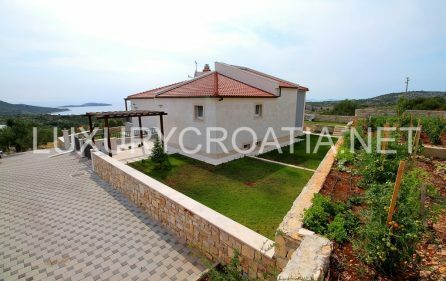 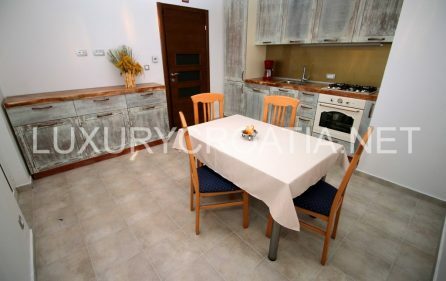 Villa consists of three different levels: basement, ground floor and mezzanine and includes 4 bedrooms, 3 bathrooms, 1 small toilet and is suitable for a comfortable accommodation for up to 8 people. 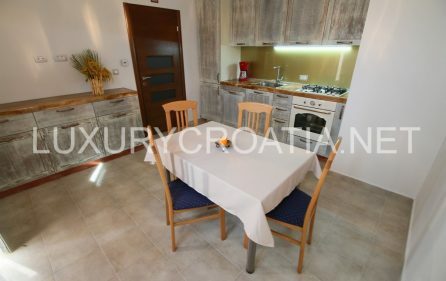 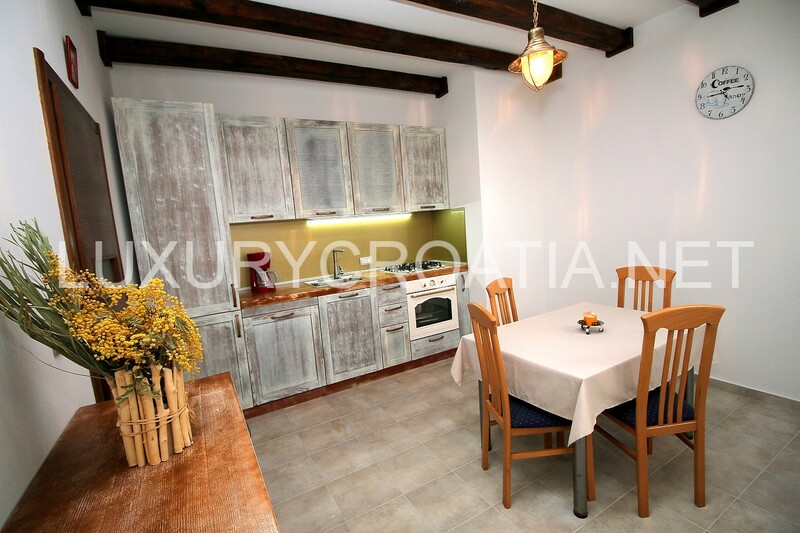 The first level is the basement, where you can find a charming kitchenette, small dining room, one bedroom with a double bed and a bathroom with a shower. 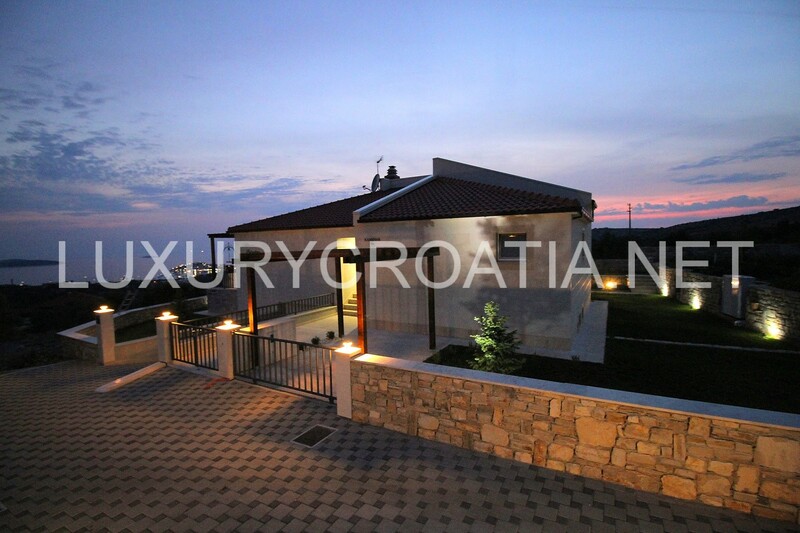 On the north side of the villa there is an entrance to the garage, which is also located on this level. 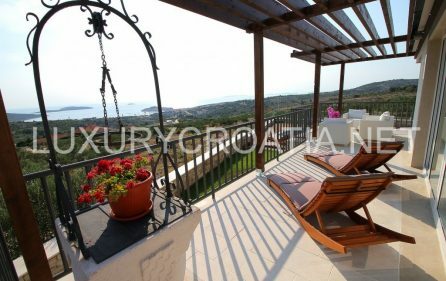 External stairs from the apartment lead to the beautiful, green courtyard that offers a limitless view of the Primosten and the Adriatic Sea. 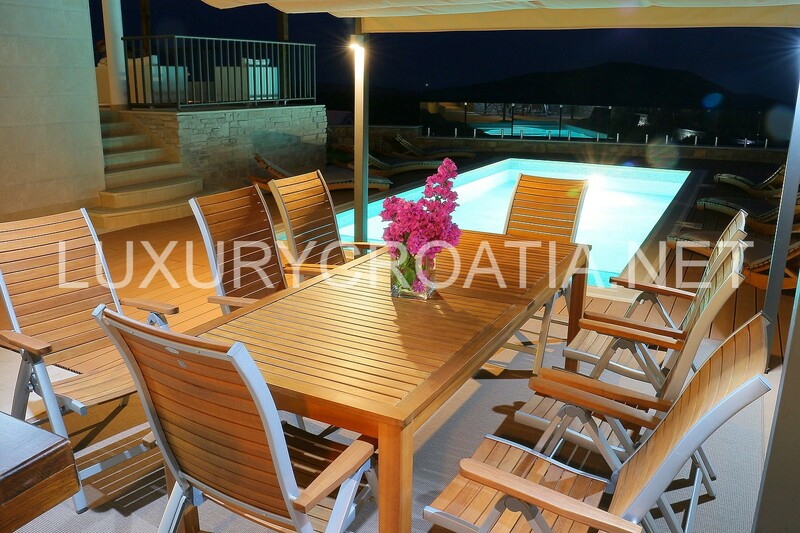 The most interesting part of the yard of the villa certainly belongs to a magical and refreshing pool (7×3.70 meters) with a sun deck and comfortable lounges, which will make every holiday special and memorable. 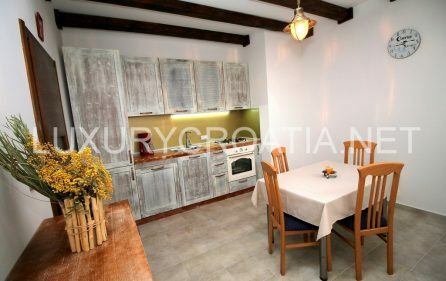 Right next to the pool there is the inevitable Dalmatian stone fireplace, harmoniously incorporated within the external summer kitchen. 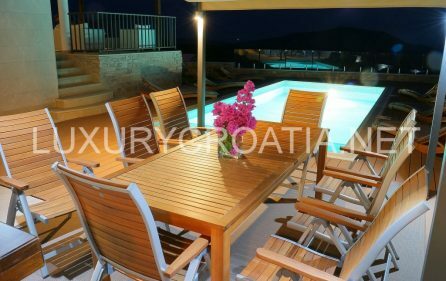 Large wooden table with chairs ideal to enjoy seasonal fruits, cold drinks, as well as all the local delicacies prepared on the grill. 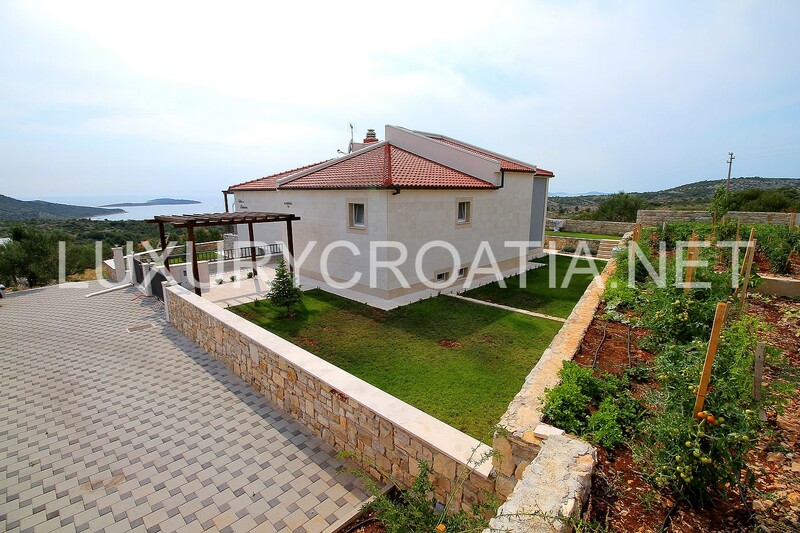 A few stone steps divide the courtyard and the ground floor of the villa. 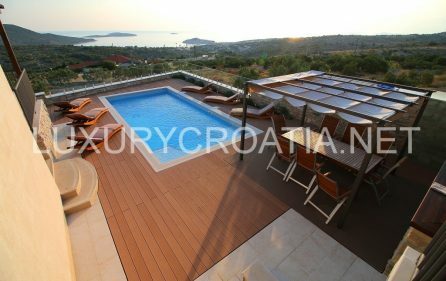 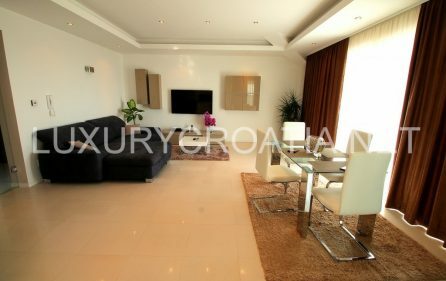 On the ground floor there is a spacious living room, connected by a glass wall with south-oriented terrace with table and chairs, which offers superb views of the sea. 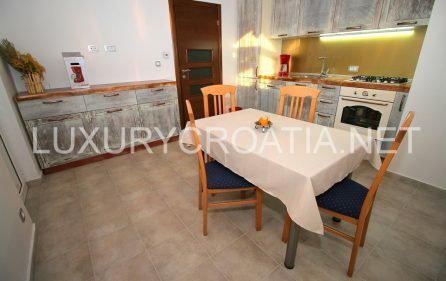 On the same level with the living room on the ground floor there is a modern and fully equipped kitchen with bar and dining area, which is characterized by simple lines, typical for the modern interior. 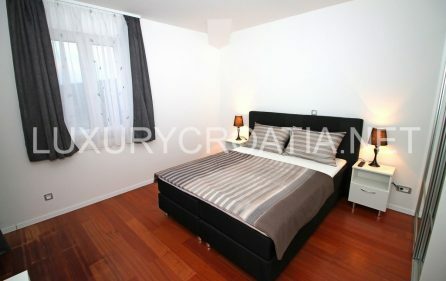 There is one more bedroom here with a double bed and a separate bathroom with shower. 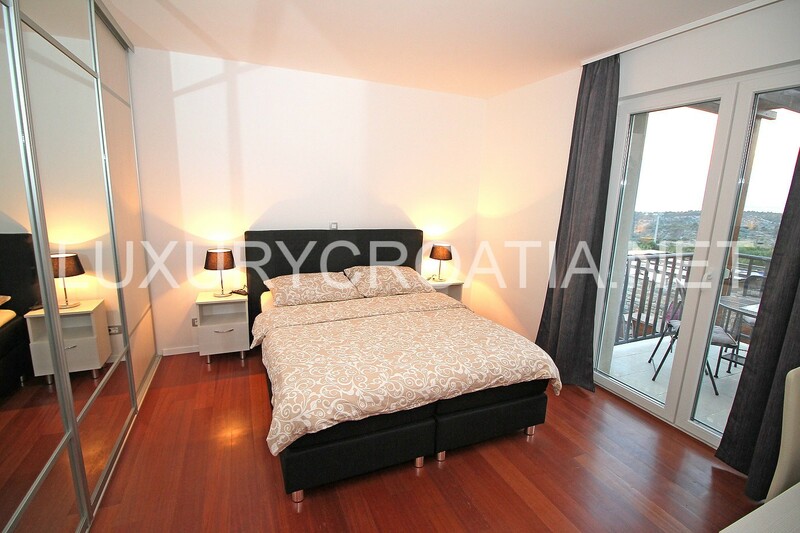 Inside the bedroom there is a private dressing room. 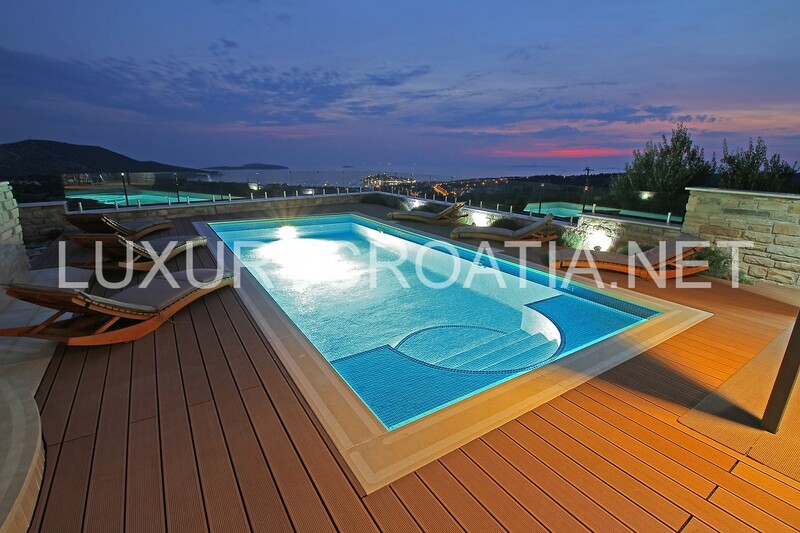 The first floor of the villa is separated from the living area with only a few wooden steps. 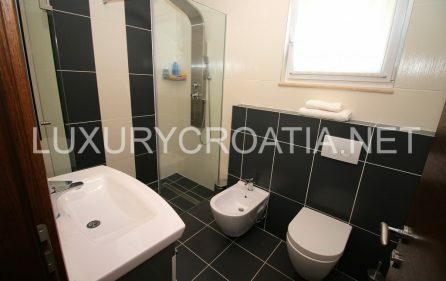 This floor’s area is designed as a relaxation zone, within which there are two spacious bedrooms with double beds and a shared bathroom with a shower. 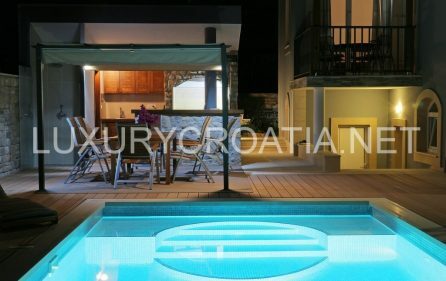 Bedroom windows reveal views of the pool, sun deck, Primosten and the unique beauty of the Adriatic Sea. 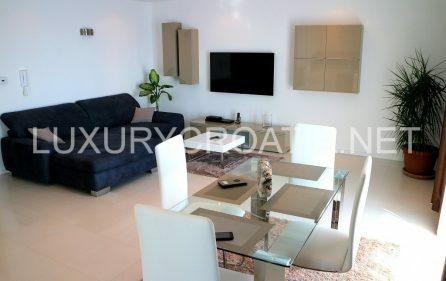 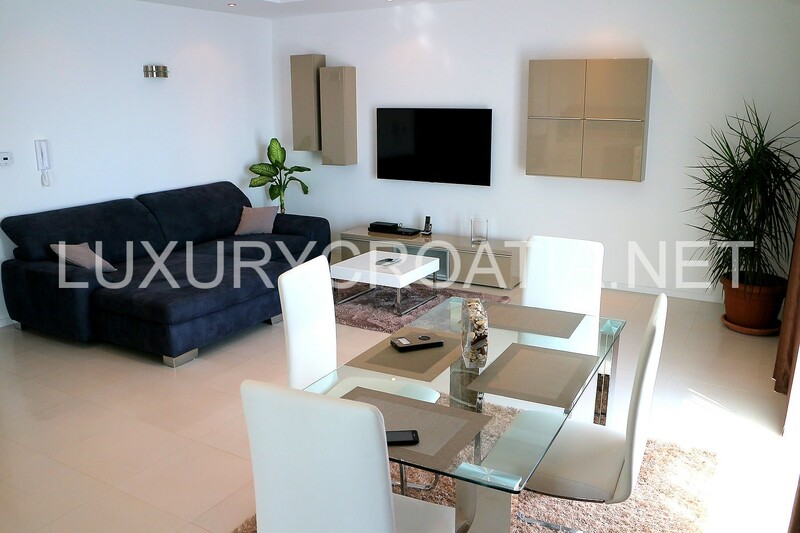 This luxury modern villa is fully air-conditioned and equipped with satellite LCD TV’s, Wi-Fi Internet access and has underfloor heating / cooling. 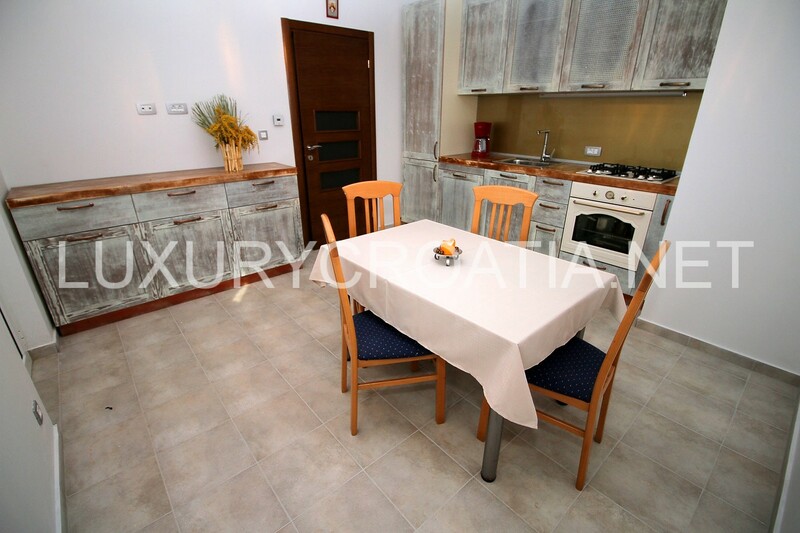 The villa has two different kitchens with stoves, oven, refrigerator, freezer, dishwasher and microwave. 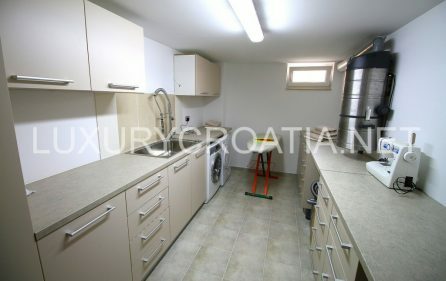 In a separate room of the villa there are washing and drying machine. 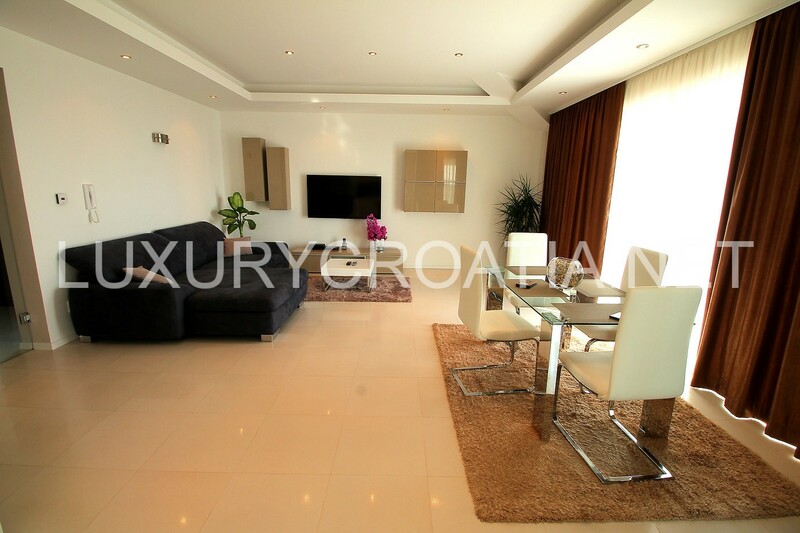 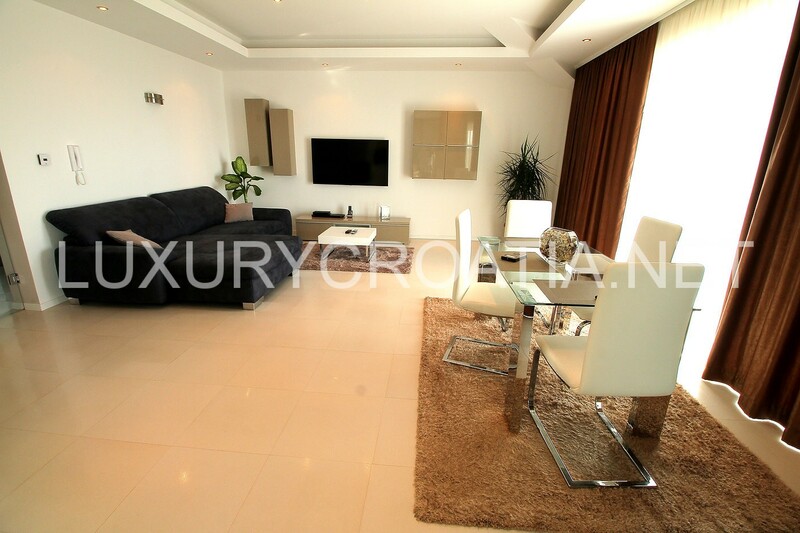 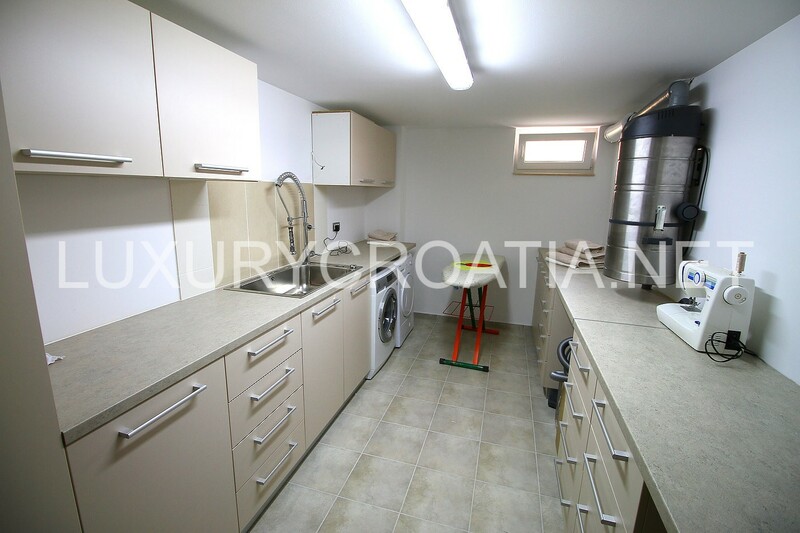 Within the basement level there is a private garage for guests.